Cor de la Bryere - Cottage Farm Inc. Although best known as a sire of jumping horses, Cor de la Bryère was also the sire of Corlandus, a World Cup Dressage Champion in 1989, and his sons Calypso I and Calypso II have proven a useful sire of dressage horses. Former German Olympic team member, Chacomo ridden by Alexandra Simons de Ridder was by Calypso I, as was Alexandra’s other FEI star, Champus. 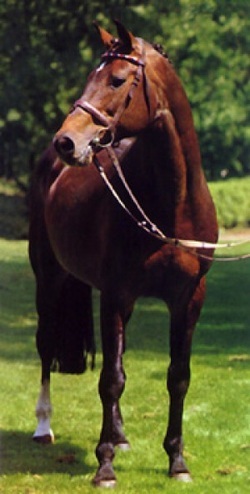 Cor de la Bryère's most successful dressage horse - Corlandus.